Dürr MEGTEC is a leader in supplying of environmental control technologies and engineered products for industrial processes including biogas related ones. Their equipment solutions oxidize, filter, recover and/or purify vapor-phase and liquid effluents from a variety of processes. MEGTEC provides products such as biogas purification systems, oxidizers, wet particulate scrubbers, odor control technologies and more. They also provides maintenance and support services. Dürr MEGTEC is a leading global supplier of environmental control technologies and engineered products tailored to meet customers’ industrial process requirements. Our equipment solutions oxidize, filter, recover and/or purify vapor-phase and liquid effluents from a variety of processes. Key environmental technologies include oxidizers, fabric filters, wet and dry electrostatic precipitators, solvent recovery systems, scrubbers, selective catalytic and selective non-catalytic reduction (SCR/SNCR) products, and distillation equipment. Dürr MEGTEC offers a full suite of emissions control solutions for VOC, particulate, H2S, NOxand SO2, acid mist and gases, odor, and more. 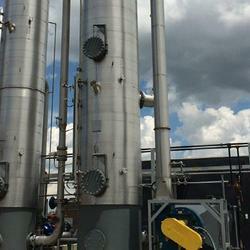 Our solvent recovery systems provide an economical solution for certain applications. We provide custom, contact-free, energy-efficient dryers for traditional converting markets and emerging markets for new, advanced materials. We offer specialized coating lines for the production of lithium-ion battery electrodes. Our aftermarket services group provides process energy optimization services that help our customers enhance equipment life, improve production efficiency and performance, and reduce energy costs. Dürr MEGTEC technicians research your equipment records and determine what replacement or spare parts are required for your specific piece of equipment. They also advise about upgrades and retrofits that have been developed for your machine. And we have a global parts stocking and distribution network with inventory available 24 hours a day, 7 days a week. There is a definite link between productivity, reliability and maintenance of equipment. The primary benefits include reduced operating costs, consistent product quality and increased life of valuable capital equipment. Maintenance also preserves capital assets and fulfills safety, insurance and regulatory obligations. Dürr MEGTEC Preventive Maintenance (PM) Services staff can help you maintain your equipment. Our team of factory-trained technicians have an average 20+ years of experience. They can evaluate your equipment needs to keep it functioning at its optimum level. They can also save you money by helping you avoid downtime, providing annual energy-saving equipment adjustments and suggesting component upgrades. Preventative maintenance and service support is available for all Dürr MEGTEC equipment! Visit the Website of MEGTEC for more information.